One of the questions guaranteed to keep motor racing aficionados arguing well into the night is just how Jim Clark and Jackie Stewart would have compared at their respective peaks. When Stewart came into Formula One in 1965 Clark was at the very height of his powers, yet frequently he was the only man ahead of the former Olympic-standard clay pigeon shooter from Dumbarton, who made a quite remarkable debut with BRM.Stewart, like Clark, had raced initially without parental consent, but elder brother Jimmy was already a racer for the world famous Ecurie Ecosse. The moment he sat in a fast car, the young man, who did not yet understand that his deficiencies at school were caused by dyslexia, discovered something that he could really do well. It filled the void left by his failure to make the British shooting team for the 1960 Olympic Games. From a quiet beginning, Stewart soon showed his mettle in a borrowed Marcos before himself joining Ecosse. But it was when he was signed for F3 by Ken Tyrrell, after beating Bruce McLaren in a test at Goodwood, that his career really took off. After dominating F3 in Tyrrell's Cooper-BMC in 1964, Stewart turned down an offer from Lotus to drive for BRM in 1965.Clark died before Stewart really benefited from joining forces with Ken Tyrrell in F1 and, in the Matra-Ford, found himself a car capable of challenging for the World Championship. But their battles in the winter Tasman series in Australia and New Zealand in 1966 and '67 had thrown up further interesting discussion fodder.Emerging from Clark's shadow, Stewart assumed the older Scot's role as yardstick, while also establishing his own unique image of long hair, Beatle cap and Rolex watch. He parlayed his speed and the ability to interpret a car's behavior into a record 27 wins before retirement beckoned in 1973. 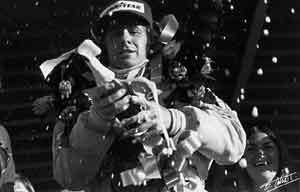 By then he had also won three World Championships, driving Matra, March and Tyrrell machinery. He was one of the few with the self-control to walk away from the driving side of the sport at his absolute peak.His driving style belied his raw speed. Where his closest rival, Jochen Rindt, was aggressive and flamboyant, Stewart achieved similar results with Clark-like smoothness, precision and persistence, and the acumen for which the Scottish race is famed. It was easy to believe that his success came from being in the right team - Tyrrell - at the right time, and to overlook just how quick he could be, which was as quick as the very best of them.More than any other racer, Jackie Stewart revolutionized safety standards with a remorseless crusade for circuit and car improvements, and was among the first to pioneer the use of safety belts and full-face helmets. Short-term unpopularity with circuit owners has long since been superseded by an enduring affection for the spring-heeled little Scot who, as the owner of Stewart Grand Prix, remained the perfect ambassador for the sport in which he so excelled, and a stylish and essential part of its fabric.Jackie Stewart was knighted in 2001.